Well, today has been extremely eventful already and its barely 1pm! I'm exhausted and so is C, partially through hard & unusual work for us and partially, or more likely, emotional. The day began with us flying out of bed around 7am, C had to walk J to school because the car has been in the garage for two days and they still haven't found the problem! All I know is that the antifreeze/water keeps leaking out and then the car computer screams at me to STOP in big red letters and the alarms start going off!! AARrrrrrgh. So at about 7.55am I leapt on my bike and peddled like a crazy woman, to the garage, to find out what was happening. Everything here in Mallorca can be very laid back, sometimes too laid back for my liking, but hey ho. It was really chilly this morning and my eyes were streaming by the time I'd got into town. The car hadn't even been looked at properly...groan!...SO I peddled, like a mad woman, back to the finca (farmhouse, for those not remembering). I saw C walking J to school and let them hurry on. 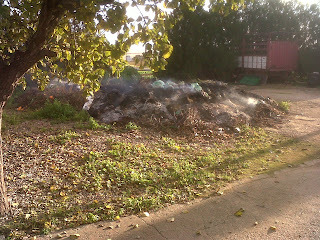 As I went through the gate I realised the bonfire was still burning from yesterday afternoon. There is a big area outside the finca gates, that we and other local farmers use as a dumping ground for all sorts of things, then the whole lot is burned up in one go. There are of course times of the year, namely the summer, when it is illegal to have any fires of this sort. Good thing too, considering the number of wild fires we get on the island. The smoke kept wafting into the chicken coop, I don't really want smoked chicken yet thanks! I prepared a huge pan with water and set it on the gas to boil up. Meanwhile I had tea and toast and put the computer on. This morning was the time of turkey dispatch to be made ready for Christmas. 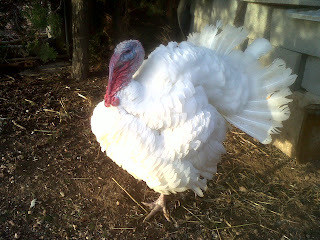 Our wonderful, beautiful turkey whom I was growing a little fond of, although he pecked me really hard yesterday - ouch! But he did look beautiful when he puffed himself up to show off. I knew he was a big bird, but we were in for a surprise! Mr and Mrs C managed to get him with not too much difficulty and little stress to him. Then we carried him away from the pen and the deed was done. I am deliberately not going into details about it as I know a couple of people are a lot more sensitive about these things than I am. Don't get me wrong..I am sensitive about these things but in a more practical way. So once done, we said thank you and goodbye to Mr and Mrs C and they offered help and advice for the future. C and I continued to deal with the bird and prepared him for hanging. So, it is done, finally. He will hang for a few days and then be frozen ready for Christmas lunch. HOWEVER.....it turns out that he is about 18 or so KG - MASSIVE. So I know that it will not go in our local bakers ovens (which is where we normally have our bird cooked on Christmas morning), so I have devised a plan. It will be cooked in our oven but because it is so big, it will probably take about 6 or 7 hours. Guess who's getting up at 4 in the morning to prep everything and put the oven on!! I feel a little saddened that Spock is gone but we got him for the purpose of rearing for meat and that is what he has become. We will enjoy it. Immediately after dressing the bird, I had to walk (at full speed) into town again, I had to be at the log man by midday. He was going to deliver a small van load of logs but wanted me to meet him as he didn't know the way. So, when I got there, he was leaning on the van waiting for me, I could hardly breathe but managed a few words of Spanish in between breaths of air. The van was loaded ready and we got in and drove back to the finca. We unloaded the logs in the middle of the driveway and he only charged me 50€ instead of the 60€ he said it would cost. I did plead poverty a little in the car but never expected him to let me off 10€. Anyway, he did so that was good. C helped the man unload and C then took the logs round the back of the house near the back door (which is undercover), so they are easy to grab when the weather is much colder and it keeps them drier. Well, this is a long post today, C has gone off to pick J up from school and I am going to have a cuppa.